Today Peterborough Cathedral is in the semi-final of a Twitter #cathedralworldcup run by @cinemashoebox - and it needs your votes! Liz Hurst from Peterborough Cathedral said: "If possible, please could you Tweet the link for voting and ask your followers to vote? Let’s do this for Peterborough!" 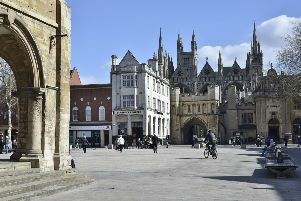 The #cathedralworldcup has featured 48 English and Welsh cathedrals in the group stages, and now at the semi-final stage Peterborough is up against neighbouring Lincoln Cathedral as well as Winchester Cathedral and Liverpool Cathedral. And the prize? Bragging rights for the individual cathedrals to lord it over each other - the banter has already begun on twitter between the social media teams!